Abstract: In 1993, a horde of Californian ‘police and prosecutors spent millions of dollars to create a case whose foundation never existed’.1 Their fruitless efforts were to incriminate Michael Jackson, a black artist who was the most commercially successful in the world. Jackson, who was in Russia on his Dangerous tour, wrote the song, Stranger in Moscow, in response to the severity of his accusations, the eagerness of the media to sensationalise them and the willingness of the public to believe them. This essay examines how Michael Jackson’s Stranger in Moscow, relates to philosopher, Michel Foucault’s concept of ‘power’. 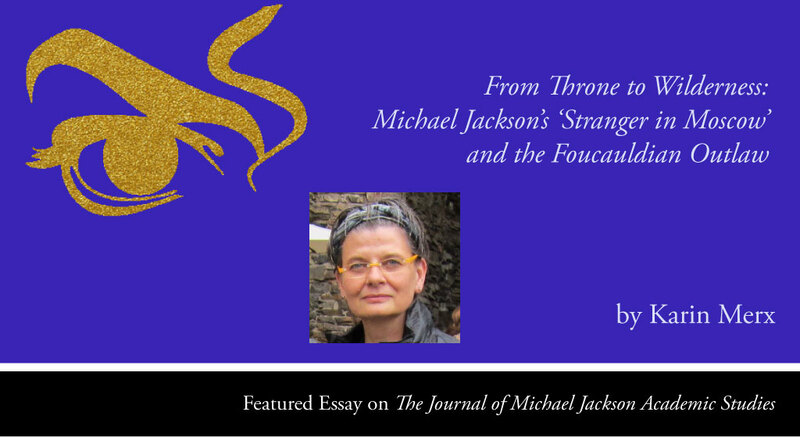 Essay by Karin Merx BMus, MA, editor of The Journal of Michael Jackson Academic Studies, and author of A festive parade of highlights. La Grande Parade as evaluation of the museum policy of Edy De Wilde at the Stedelijk Museum Amsterdam published with academic publisher Eburon. Merx, Karin. “From Throne to Wilderness: Michael Jackson’s ‘Stranger in Moscow’ and the Foucauldian Outlaw.” The Journal of Michael Jackson Academic Studies 1, no. 4 (2015). http://michaeljacksonstudies.org/from-throne-to-wilderness-michael-jacksons-stranger-in-moscow-and-the-foucauldian-outlaw/. Jackson’s accomplishments brought him, like Elvis Presley before him, the rightly-earned title of ‘king’. As ‘king’ Jackson was humble, intelligent, very talented and extremely hardworking. However, every medal has two sides, and for Jackson constantly being in the public eye, although it granted him great renown and success, also made him the centre of gossip and ridicule. Jackson wrote in Moonwalk that because of his success with Thriller, the constant exposure to the public made him weary and as a result of that, he was resolved to live a more private life. Because of his ensuing withdrawal from the public referred to as, ‘the most spectacular disappearing act since Halley’s comet’, academic, Joseph Vogel writes: ‘by 1987, Jackson the human being no longer seemed to exist to a public fed on sensationalism and hype.6 However, Jackson’s lifestyle choices, like hiding the vitiligo from the public, his provocative art and possible public relations faux pas (such as the photo in the hyperbaric chamber), may have played a crucial role. In her dissertation, ‘Indications of Negative Attitude with Words Denoting Mental Illness and Low Intelligence in Dictionaries’, Joanna Nyrke writes that the ‘associations between mental illness and funny behaviour have existed for long, and many expressions in this semantic area are humorous, and openly make fun of the topic of mental illness or low intelligence. Such terms include fruitcake, nuts, wacko, bonkers and bananas, to mention only a fraction.’12 However, there was no humorous side to the use of ‘wacko’, it was used to degrade and dehumanize the most influential black artist in the world; it was simply contempt disguised as humour. The ongoing resonance of the ‘Wacko Jacko’ moniker begs the question: who in society decides what is seen as ‘normal’ or ‘abnormal’? Philosopher, Michel Foucault researched the origin of what we now consider ‘normal’ behaviour. He started his study with the seventeenth and eighteenth century where madness was banned from daily reality and brought together with morally reprehensible conduct.15 ‘Foucault argues that contemporary society is based on medical notions of the norm, rather than on legal notions of conformity to codes and the law.’16 The knowledge about what we consider ‘normal’ is obtained by completely excavating ‘abnormality’.17 And for that matter, whiteness is defined by degrading blackness, which was another layer added to the so-called ‘abnormality’ of Jackson; after all, he was a black artist. Foucault explained: ‘if you are not like everybody else, then you are abnormal, if you are abnormal, then you are sick. These three categories, not being like everybody else, not being normal and being sick are in fact very different but have been reduced to the same thing.’18 Artists, according to Foucault, are by definition, and through centuries, able to ascertain the border of ‘normal’ and ‘abnormal’.19 And those declared ‘abnormal’ had to be disciplined. But isn’t it exactly the power of the artist, to be able to think out of the box? However, if the power of the artist is undermined, it calls for resistance, a point that will be picked up later. It is with good reason that Amisu writes, ‘we must consider a holistic representation of Michael Jackson, one which is not based on conjecture and tabloid sensationalism but hard evidence. It is the literary academic’s place and duty to write about Jackson, the artist. For this is what he was. Only through academic study of his life and creative work can we gain insight into his genius and innovation’.25 But since Jackson walked the tightrope between high and low art, neither side seemed to understand his work or take him seriously. When the album HIStory – Past, Present and Future, Book I came out, music critic Patrick Macdonald wrote in the Seattle Times, ‘Strangely, for a man who has just gotten married, after what must be assumed was his very first love affair, there are no outright love songs, except for perhaps “Stranger in Moscow,” a pretty ballad interspersed with sounds of rain.’44 Yet, the song and with it the short film are as distanced from a ‘love song’ as they can be. Macdonald made Jackson a joke; ‘abnormal’ in his critique, by assuming Jackson was slow in his emotional and sexual development, smearing his marriage at 36 with his alleged ‘first girlfriend’ (without proof of that fact), reducing the album for not having ‘love songs’ and totally misconstrued Stranger in Moscow. Why was Jackson’s marriage at 36 any different from other celebrities that married late, like actors Vince Vaughan and Jerry Seinfeld, who married at age 40 and 45 respectively? Armond White wrote that Stranger in Moscow was Jackson’s finest track since ‘Billie Jean’, and Vogel writes that, although ‘it never made any greatest-hits collections’, it is one of Jackson’s ‘most impressive artistic achievements and, over time, will no doubt be recognised as such’.45 I couldn’t agree more. In spite of that, the visual motif of black and white, employed by Bad’s director, Martin Scorsese, famous for his dark films Mean Streets and Taxi Driver, has even more to do with an expressionistic representation of alienation, ‘Daryl immediately seems sad to be going back home, which raises a narrative enigma – where is home?’ and ‘Daryl, however, is going from safety to conflict […] is not really part of their world. The train has transported him from fantasy to reality but he is still a visitor.’47 If we look at Stranger in Moscow, this feeling of being a visitor, the feeling of alienation, estrangement, is what the short film reveals. The film shows a dark gritty city, the streets are wet from the rain; people walk hastily and car’s drive by. The city depicts the wilderness, where Jackson the outlaw was abandoned to, where he was lost within a sea of faces. Stranger in Moscow introduces five people who are equally alone or abandoned by society: a man stands behind his window looking outside, a woman in a cafe sits alone on a table staring at her hands, a beggar lies in a corner looking up to passers-by, a teenager watches children play baseball from a distance and a neatly dressed man sits on a bench staring into the nothing. The world, at first, seems to float by in real time, but as soon as the strumming guitar sets in, and the woman in the cafe turns her head and looks out of the window, she sees people passing by in slow motion. Right after this shot, Jackson is introduced as the sixth person, walking the street where no one seems to recognise him. What we see is the world in slow motion; it is Jackson’s point of view and depicts how abandoned he feels. On the one hand, the slow motion has the function of magnifying emotion, and on the other hand it shows two different worlds and the distance between those two worlds. All six ‘characters’ are excluded, possibly ‘dogged’, and clearly not feeling at home. For them their world is a prison. For Jackson, the ceaselessly public prying eyes had always felt as a ‘prison’ or ‘fishbowl’, which can be referred at as the Panopticon, used as a metaphor by Foucault for a world of surveillance to discipline, a model that is present within all social relations.48 But for Jackson, anonymity was never a reality, and his ‘magically’ cinematic outlawing is a form of liberation, and as in Bad, this fantasy was born out of a lack of recognition. Even though the six estranged people seem to have something in common, Jackson is still the outsider. He doesn’t appear to belong to them either, dressed, not in stage costume, but in a black trench coat, black trousers and heavy boots. His face, on the other hand, is so white, it is glowing, in a state that reminds us of the glowing tiles and feet in the short film Billie Jean. Although, in Billie Jean the glowing tiles represent a repressed kind of magic: Jackson supernaturally escapes the photographer who is stalking him. Throughout his art Jackson depicts his battles against stalkers, journalists and photographers, the paparazzi who he had to escape from on a daily basis. The difference is that the provocative act of the extreme close up of his face in Bad, is nowhere to be found in Stranger in Moscow, it’s the difference between the ‘my face is my own’ mask and ‘see me simply as a person’ mask. The latter, is the way Jackson tries to escape from the constant attacks, the constant feelings of being watch and judged. It is also what brings the utter mood of loneliness and that is what he shows us in Stranger in Moscow. ‘How does it feel?’ We from the world of ‘ordinary human standards’, we have no clue at all. Russia, at that time, was mainly struggling with domestic reforms, trying to become more democratic, but Russia wasn’t so much the problem for Jackson, or was it?50 Jackson, as a very rich American from the West, could have been easily seen as danger as the closing lines of the lyrics imply, ‘Why have you come from the West? Confess! To steal the great achievements of the people, the accomplishments of the workers?”51 However, the real danger came from his homeland, America. Upon his return, he found his house ransacked and he had to endure humiliating inquiries. He was already convicted. Where was the innocent until proven guilty? A civil right one might expect from a civilised country? Vogel refers to ‘Stalin’s tomb won’t let me be’ as metaphor for Jackson as trapped in a hotel during his tour.52 However, I take this a bit further and refer to it as the metaphor of concrete remnants of a system where millions of people were killed, and civil rights ruthlessly overrode. For Jackson, and black people in general in America, that wasn’t any different. Jackson was falsely accused and dogged by the FBI /‘KGB is doggin me’/, who tried to convict him with a racist law; his own country was belittling him/‘Kremlin’s shadow belittlin’ me’/ -which also has a racist implication-.53 Jackson couldn’t openly express his anti-American sentiment, but he was a master of disguise. He was well aware of the position of the two superpowers at the Cold War and their history. Stranger in Moscow, illuminates the features they share, the lack of civility and civil rights that Jackson was subject to. Subject matters of a very well educated black artist; subjects not that often seen in commercial work. Perhaps that was the reason music critics couldn’t comprehend it, for how could you acknowledge that a black best selling artist was also highly intelligent? These last repeated phrases from Sharpton: ‘Michael never stopped’, resonate the ostinato rhythm that is at the base of the song. Ostinato is a musical term for a persistent phrase or rhythm. Vogel refers to it as ‘dull’, but you can also say that the ostinato in Stranger in Moscow resembles stubbornness. This stubbornness I would describe as the sound of defiance. When it starts to rain people run away while the outsiders step into the rain one by one. Even Jackson, who at first shields under an awning, steps out into the rain. It will not be long before he starts to fight. The king who was abandoned, who was treated with utter contempt, and not taken seriously as an artist screamed, “We’re talking danger baby!”, danger that came from his homeland, due to false allegations. However, Jackson knew he was innocent, and he would fight back. The rain washed off all loneliness and represents the biblical cleansing or baptising; the ostinato keeps going till the bitter end. ‘Michael never stopped’. On this point we return to the basic question of this essay how Stranger in Moscow relates to Foucault’s concept of power. The song was written out of pain, anger and grief. Pain is a source for an artist to base his work on. Artists think out of the box, it is what they do; it is what they are good at. They can take us into a world we never visited before, they are able to expand our vision. Isn’t that what we want from an artist? But if we demand an artist to act as what we think are ‘ordinary human standards’, he will resist, he will provoke. And so did Michael Jackson. Jackson was the black artist, who broke the code of ‘normality’, but that was never accepted as such. He was received with unmitigated contempt, and never acknowledged as the artist he was. Jackson, who was falsely accused, wrote a song that revealed his anguish and his utter loneliness, but at the same time bore a layer of intransigence, a form of protest in the stubbornness of the ostinato and in the disguised lyrics. In Foucault’s terms a very ‘productive’ form of power opposed to the so-called repressive moral power of the tabloid press, and music critics alike. Jackson was outlawed by society. On the other hand he also estranged himself, and he took that position on purpose. It was a form of escapism that he needed to create his work, as any artist who takes his work serious, but it was also an attempt to withdraw from the public prying eyes. However, the latter was not really a reality for Jackson and therefore he used his art to create dreamlike escapes. We have seen this in Bad, Billie Jean, Scream, and in Stranger in Moscow. Jackson’s resistance was not always subtle; he often was very provocative and took things to the edge of what we consider decent, or exceeded that border. That caused a lot of the negativism around his person. However, the condescending way the tabloid press portrayed Jackson will, in time, be reduced to nothing more than a minor footnote in the history of a renowned very talented black artist. Their lies will be washed away as a footprint in the sand on the edge of the tide line. Michael Jackson’s art, however, his unprecedented influence on culture, music and short film, will live on forever. Karin Merx, BMus, MA is the cover artist and illustrator of the first comprehensive academic book on Michael Jackson, ‘The Dangerous Philosophies of Michael Jackson: His Music, His Persona, and His Artistic Afterlife‘. Merx is founder and editor of the world’s first peer-reviewed academic journal on Michael Jackson’s art, life and work, The Journal of Michael Jackson Academic Studies and she is co-presenter of the acclaimed podcast, ‘Michael Jackson’s Dream Lives On: An Academic Conversation’, mentioned in iTunes as ‘New and Noteworthy’. Merx is an artist and academic. She studied at the Academy of Music in Amsterdam, and is alumna of Conservatorium van Amsterdam and the Open University, Netherlands and holds qualifications in Art History. For The Journal of Michael Jackson Academic Studies, she wrote the well-received article: ‘From Throne to Wilderness. Michael Jackson’s ‘Stranger in Moscow’ and the Foucauldian Outlaw‘ and a book review on ‘Dangerous‘ by Susan Fast. This review is also translated in German and Italian. Find out more at karinmerx.co.uk. 1. Mary A. Fisher, Was Michael Jackson Framed? The Untold Story That Brought Down A Superstar (iBook 2013) 73. 3. Sara Tenenbaum, I Know I Am Someone: Michael Jackson, Thriller, and American Identity (George Washington University 2011) 47, 64-65. 4. Jones, Q. The Autobiography of Quincy Jones, 239. 5. For an extended list of humanitarian work see: http://www.michaeljacksonslegacy.org/index.php/his-humanitarian-work [accessed 12-05-2015] and Joseph Vogel, Earth Song. Inside Michael Jackson’s Magnum Opus (New York 2012) 11; For a list of awards see: http://www.aceshowbiz.com/celebrity/michael_jackson/awards.html#axzz3csLlWZ95 [accessed 12-05-2015]. 6. Michael Jackson, Moonwalk (New York 2009) iBook, 226; Joseph Vogel, Man in the Music. The Creative Life and Work of Michael Jackson (New York 2011) 105. 7. Elizabeth Amisu, ‘Bad (1987)’: Genius. The Short Films of Michael Jackson 1/12’, Michael Jackson Academic Journal 1 (2014) [accessed 10-05-2015]. 8. Conversation with Academic, Elizabeth Amisu, 26-04-2015; Quincy Troupe, ‘Michael Jackson Bad 1987’, Spin http://www.spin.com/2014/06/michael-jackson-bad-1987-cover-story/ [accessed 10-05-2015]: ‘Many of the attacks came from white rock critics who suddenly seemed to resent his unparalleled success […] Jackson represents a black cultural heritage that white rock critics either don’t know about or would rather appreciate nostalgically from someone who’s dead.’; Armond White, Keep Moving. The Michael Jackson Chronicles (New York: Resistance Works 2009) 106; Joseph Vogel, ‘The Misunderstood Power of Michael Jackson’s Music’, The Atlantic http://www.theatlantic.com/entertainment/archive/2012/02/the-misunderstood-power-of-michael-jacksons-music/252751/ [accessed 10-05-2015]; Susan Fast, Dangerous (London, New York: Bloomsbury 2014) 5-6. 9. Elizabeth Amisu, ‘Throwing Stones to Hide Your Hands: The Mortal Persona of Michael Jackson’: The Dangerous Philosophies of Michael Jackson 1/12. 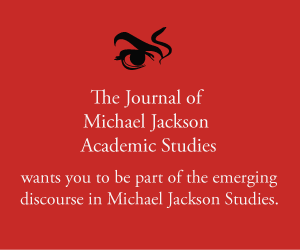 Michael Jackson Academic Journal 1 (2014) [accessed 10-05-2015]. 10. Jida Al-Husami, Why We Dress Like We Do Case: The Androgynous Look – Gender Identity as an Aspect of Identity-formation http://www.academia.edu/5997422/Fashion_and_identity_Androgynous_fashion, 8 [accessed 11-05-2015]; http://www.thelowry.com/events/andy-warhol-divas/the-divas/altered-ego/ [accessed 10-05-2015]; more about the life of Andy Warhol see: https://www.youtube.com/watch?v=KnhqRiJ4KH8 [accessed 11-05-2015]; More on gender ambiguity Michael Jackson: John Izod, ‘Androgyny and Stardom: Cultural Meanings of Michael Jackson’, The San Francisco Jung Institute Library Journal 14 (1995). https://www.psychologytoday.com/blog/beautiful-minds/200912/george-and-lennox-gaga-and-lambert-androgyny [accessed 10-05-2015]; Susan Fast, ‘Difference that Exceeded Understanding: Remembering Michael Jackson (1958–2009)’, Popular Music and Society 33 (2010) 4. 11. Susan Woodward, Otherness and Power; Michael Jackson and his media critics (Blackmore Books 2014) 22. 12. Joanna Nyrke, Indications of Negative Attitude with Words Denoting Mental Illness and Low Intelligence in Dictionaries: A Comparative Study on Dictionaries and Language Corpora (School of Modern Languages and Translation Studies English Philology, Tampere University 2010) 18. 13. Joseph Vogel, ‘How Michael Jackson Made ‘Bad’’, The Atlantic 10-09-2012 (http://www.theatlantic.com/entertainment/archive/2012/09/how-michael-jackson-made-bad/262162/ [accessed 10-05-2015]; See also the interview of Michael Jackson with Barbera Walters in 1997: https://www.youtube.com/watch?v=rNkXLTw_yPw [accessed 10-05-2015]. 14. Henry Louis Gates Jr. and Cornel West, The African-American Century: How Black Americans Have Shaped Our Country (New York 2000) 326-328. 15. Michel Foucault, Discipline and Punish: The Birth of Prison, translated by Alan Sheridan (London 1977); Michel Foucault, Madness and Civilization. A History of Insanity in the Age of Reason, translated by Richard Howard (New York 2006). 16. http://www.michel-foucault.com/concepts/ 2007 [accessed 10-05-2015]. 17. Karin Merx, The words and the Infotomes (BA thesis Cultural Philosophy, Heerlen 2009) 6-7. 18. Michel Foucault, ‘Je suis un artificier’. in: Roger-Pol Droit (ed. ), Michel Foucault, Entretiens (Paris: Odile Jacob 2004) 95; Interview conducted in 1975. This passage trans. Clare O’Farrell. 21. Vogel, Man in the Music, 105. 22. Sadiah Qureshi, ‘Displaying Sarah Baartman, the “Hottentot Venus”’, History of Science 42 (2004) 233. 24. Michael Jackson in an interview with Oprah Winfrey in 1993, https://www.youtube.com/watch?v=BbItFJJPPmA [accessed 10-05-2015]. 25. Amisu, ‘Throwing Stones to Hide your Hands’. 26. Adrian Grant, Michael Jackson: A Visual Documentary The Official Tribute Edition (Omnibus 2009) 159. 26. Amisu, ‘Throwing Stones To Hide Your Hands’. 27. Frank Cascio, My Friend Michael An Ordinary Friendship With an Extraordinary Man (William Morrow 2011) 61. 28. Owen Hatherley, ‘Stalin’s Tomb Won’t Let Me Be: Michael Jackson as Despot’, The Resistable Demise of Michael Jackson (2009) 198-199. 29. Susan Fast, ‘Michael Jackson’s Queer Musical Belongings’, Popular Music and Society 35 (2012) 298. 30. White, Keep Moving, 67-68. 31. Martin, Sylvia J, ‘The Roots and Routes of Michael Jackson’s Global Identity’, Society 49 (2012) 5-6. 32. Vogel, Man in The Music, 192. 33. Willa Stillwater and Joie Collins (et al. ), ‘Some Things in Life They Just Don’t Want to See’, July 12, 2011, https://dancingwiththeelephant.wordpress.com/2011/12/07/some-things-in-life-they-just-dont-want-to-see/ [accessed 13-06- 2015]. 34. Woodward, Otherness and Power, 88-89. 36. Michael Jackson in an interview with VH1, http://www.allmichaeljackson.com/interviews/vh1interview.html [accessed 10-05-2015]. 37. Cascio, My Friend Michael, 63. 38. Amisu, ‘Throwing Stones to Hide Your Hands’. 39. Fischer, Was Michael Jackson Framed? , 51. 40. Michael Jackson Responds to Allegations of Child Molestation, https://www.youtube.com/watch?v=855qMXaFl-E [accessed 3-05-2015]. 41. Michel Foucault, Punish, Discipline and Surveillance, 57. 43. Patrick Macdonald, ‘”History” Lesson: Jackson’s Living On Past Glories’, Seattle Times http://community.seattletimes.nwsource.com/archive/?date=19950621&slug=2127467 [accessed 2-05-2015]. 44. White, Keep Moving, 61; Vogel, Man in the Music, 193. 47. Peter van Zilfhout e.a., Denken over cultuur (Heerlen 2003) 49. (Dutch); The Panopticon was an architectural invention in the late 18th century from philosopher and social theorist Jeremy Bentham. The purpose of the Panopticon was to discipline people. Whether it be prisoners, labourers or school children, everyone needed to be disciplined according to the morality of that time; Jackson, Moonwalk, 226; Shmuley Boteach, The Michael Jackson Tapes (iBook) 258. 50. Hatherley, ‘Stalin’s Tomb Won’t Let Me Be’, 200. 51. Vogel, Man in The Music, 194. 52. Fisher, Was Michael Jackson Framed? ; Charles Thomson, FBI File Reveals Attempt to Convict Jackson with Racist Law, 03-01-2010 (http://charlesthomsonjournalist.blogspot.co.uk/2010/01/fbi-file-reveals-attempt-to-convict.html) [accessed 11-05-2015]. 53. Vogel, Man in the Music, 171. 54. Rossiter, ‘”They Don’t Care About Us”: Michael Jackson’s Black Nationalism’, Popular Music and Society 35 (2012) 207. 55. Jason King, ‘Form and Function: Super Stardom and Aesthetics in the Music Videos of Michael and Janet Jackson’, Velvet Light Trap 44 (1999) 80-96. 56. White, Keep Moving, 105. 29th June 2015 Karin Merx Comments Off on Episode 1 – Was Michael Jackson an Artist?